From grilling an all-American burger to frying eggs to broiling the perfect salmon steak, the equipment you'll find here is some of the most relied-on in a commercial kitchen. 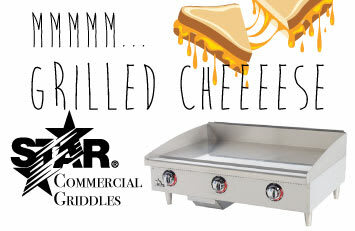 A commercial grill or commercial griddle can be used to prepare menu items for any time of the day, from breakfast to dinner. Broilers are great for cooking large amounts of food quickly and consistently. Charbroilers let you create dishes with the classic taste and appearance you can only get by cooking over a fire. KaTom has a restaurant grill with options to suit your restaurant's needs. A commercial griddle is great at every daypart, with a flat surface perfect for pancakes, grilled sandwiches, and steaks. The charbroiler is valued by cooks for its ability to add a seared flavor and classic markings to items ranging from vegetables to steaks and seafood. Commercial outdoor grills offer the much-loved flavor of a backyard cookout for restaurants and catered events. Gas and charcoal models available. Use grill cleaning tools to help ensure your commercial cooking equipment provides long service lives and produces fresh-tasting food. A teppanyaki griddle is commonly found front-of-house in Asian restaurants, where skilled chefs use it to create an entertaining group dining experience.